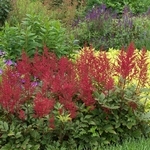 Astilbe japonica 'Red Sentinel'. Considered by many to be one of the finest red astilbe on the market. The leaves are forest green with mahogany-red stems. A sport of astilbe 'Koblenz'.